My husband is not a cake eater, but I have seen him eat cake, maybe 4 times in the last 24 years we’ve known each other. In the past whenever his birthday came around I always made a cake for him, but he wouldn‘t eat it, so I either ate it myself or I took it to work. I stopped making him cake a long time ago and started making him his favorite meals, like the lasagna he loves so much. 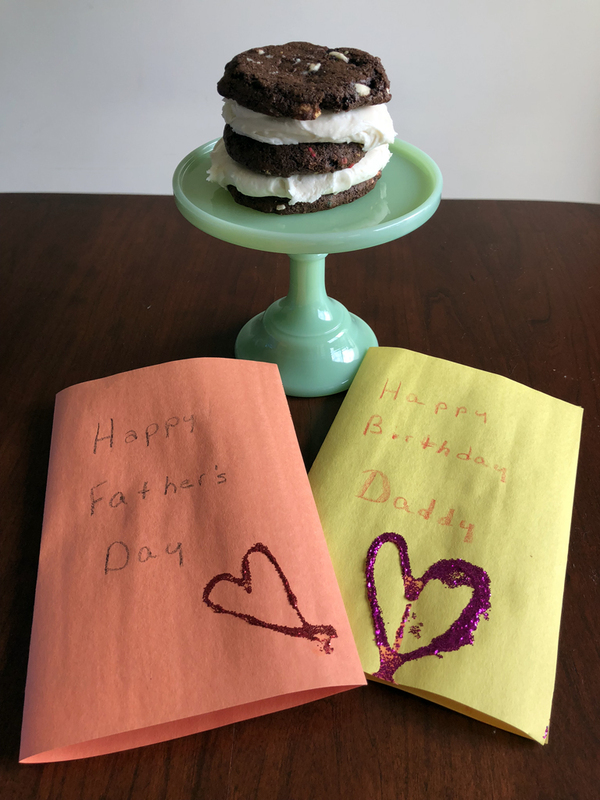 He also loves my cookies, but I kinda miss making cake, so that’s when I remembered that I have a cake mix cookie recipe I could use to make a big cookie cake out of it and add sprinkles and frosting! Only 4 ingredients are needed: cake mix of your choice, 2 eggs, unsweetened applesauce, and chocolate chips. I chose yellow cake mix for the cookie cake, and if you prefer, vegetable oil works in place of the applesauce. I just like using applesauce to eliminate the fat. A low-fat cake…sure, why not? And if you want to add the sprinkles, go ahead and include them as you mix the ingredients. Then for decoration I used the traditional buttercream frosting and piped the edges in purple (purple is used a lot for his band) and black for the letters. Yep, he turned 39! 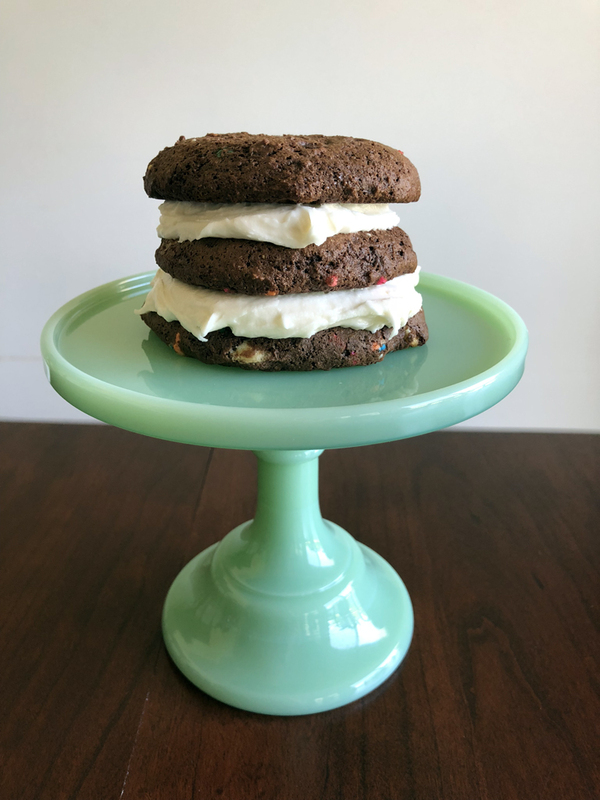 Since I had some frosting left over and a box of devil’s food cake mix, I made some large cookies, took 3 of them and stacked and frosted them like a small cake. I ended up making a couple of them. They were so cute that Alex wanted one for her birthday. 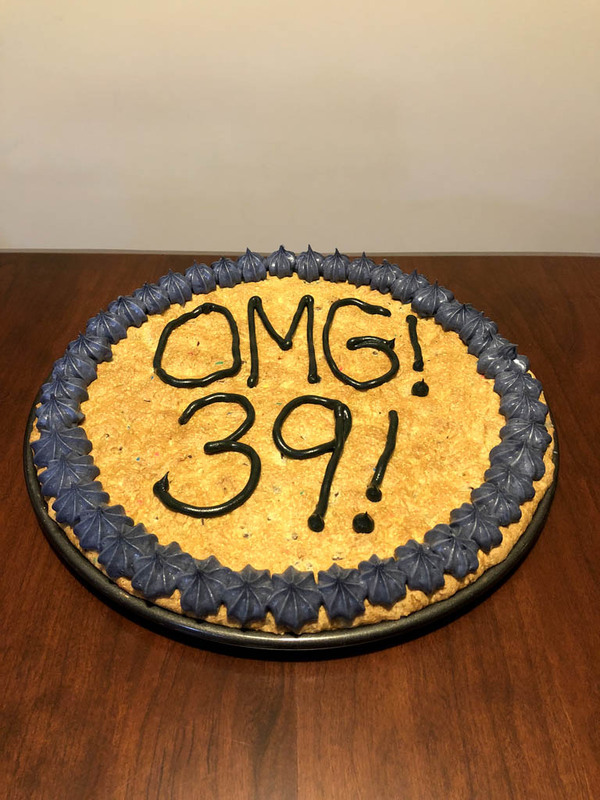 Heck I’ll make individual cake mix cookie cakes for her guests when the time comes! For someone who doesn’t eat birthday cake, I think you’d enjoy this kind of cake! • Preheat oven to 350 degrees. Spray a round 14-inch pizza pan with non-stick cooking spray; set aside. • In mixer bowl, combine all ingredients until blended. • Scoop mix onto prepared pizza pan and with floured hands or a rubber spatula flattened out the dough until it reaches to the edge of the pan. • Bake for 21-25 minutes until golden brown, and a toothpick inserted in the center of the cake comes out clean. • Remove from oven and cool completely on a wire rack before decorating. Mix all four ingredients together in a mixing bowl, starting out at low speed for about 20-30 seconds, then to medium speed for a couple minutes until it is a smooth consistency. *If frosting is too dry and lumpy, carefully add more milk, 1 tablespoon at a time, until smooth. • Use disposable frosting bags with tips or a decorating tool to decorate your cookie cake. 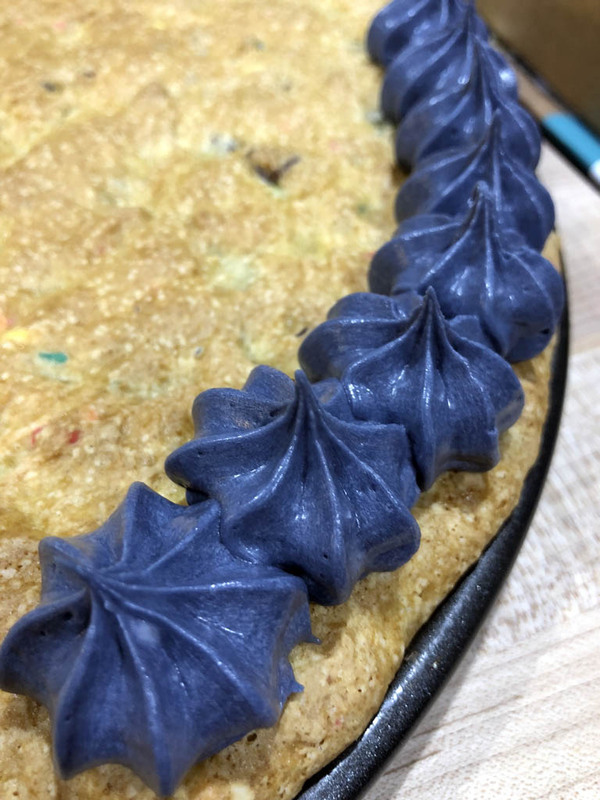 • If creating a border, don’t frost all the way to the edge of the cookie cake. That way your fingers won’t get frosting on them while lifting up the pan. Start your border about 1/4-inch to 1/2-inch from the edge. • Use above ingredients for cookies, but use a large scoop to drop each cookie onto a greased or silicone mat-lined baking sheet. Bake cookies in a 350-degree oven for 13 minutes until golden. Cool completely on wire racks. • To assemble the mini cakes: Place one cookie on a plate and spread a heaping tablespoon of frosting on top. Then stack a second cookie on top, lightly pressing down so frosting can be exposed at the edges. Frost the top of the second cookie, then repeat with a third cookie, pressing lightly. Frost the top of the third cookie, and finish your mini cake off with sprinkles if desired.